R.D. 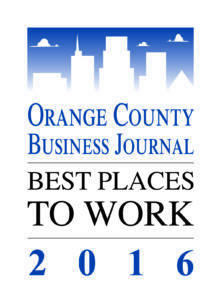 Olson Construction is incredibly proud to have been recognized as one of the top workplaces in Orange County for 2016. This achievement is attributed to our outstanding staff who go above and beyond to work as a team and stay connected as not just associates but as a family united. The dedication of our team members is something that drives the entire success of our business and every individual within the organization makes it a pleasure for every other associate. Hard work can also be fun, and at R.D. Olson we constantly strive to make our environment as enjoyable as possible.